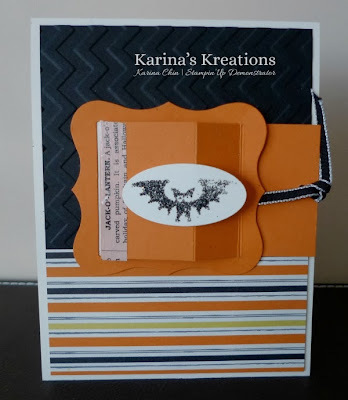 Karina's Kreations: Peekaboo Slider Card Technique! I have a video to share with you today! I'm going to show you how to make this super cute Peekaboo Slider card! I typed up a technique sheet for my Super Fun stamp night friends. 1. Cut a peek-a-boo frame with the peek-a-boo die and the Big Shot die cut machine. 2. Line up the left hand side of the frame in the Stampin' Trimmer at the 1-3/4" mark. Score the inside of the frame using the scoring blade. Make a mountain fold with this score line and fold the frame door back to open it. 3. Cut 3-1/4" x 2" piece of card stock and score at one end at 1/2". Place sticky strip on the 1/2" end and slide into the frame. Attach the sticky strip piece to the inside of the frame on the left hand side. 4. Attach to the card with mono multi glue over 2-1/4" x 2-1/2" Whisper White card stock. Add glue to three sides of the frame only. 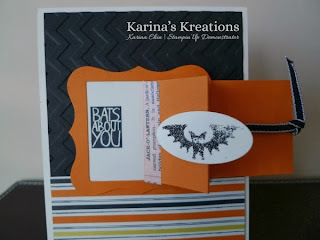 I used the Halloween Hello stamp set #131721 and Witches Brew Designer Series Paper #132185. The bat was stamped with Versamark ink, heat & stick powder and then Black Glitter. I made a heat & stick video too. It was on my last newletter. Email me at kchin2@telus.net to get the link. I hope you try this technique!